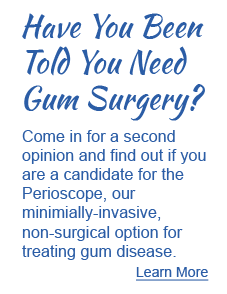 We can treat most cases of gum disease without surgery, using the Perioscope. However, when surgery is required, we ensure you are comfortable and pain-free throughout the procedure. Less than 10% of our patients require periodontal surgery because we are able to effectively treat most cases with the non-surgical Perioscope procedure. When do we use traditional periodontal surgery? Our doctors are nationally renowned leaders in the prevention of gum disease, and can treat most cases of periodontal disease without surgery. Traditional periodontal surgery is used when there is an excess of soft tissue, jawbone needs to be rebuilt or periodontal disease has reached its most severe stages. Your comfort is a top priority for our entire team. We offer pillows for neck or legs and soft blankets to keep you cozy. Our doctors provide gentle, painless injections and local anesthesia to ensure your complete comfort. We also offer oral and IV sedation for anxious patients and longer procedures. Patients do not report discomfort during or after this procedure! We can then thoroughly clean hardened bacterial buildup from the roots, leaving a smooth surface that is difficult for bacteria to cling to. This allows the gum tissue to regenerate without further irritation and reattach to the roots of the teeth. The area is then medicated, and the gum flap is replaced and sutured, providing an environment for the bone and gum tissue to heal. One of the goals of flap surgery is to reduce the depth of the periodontal pockets to make them easier to keep clean in the future. Bone loss can occur as a result of periodontal disease. Our doctors have a variety of options for rebuilding jawbone at their avail, and will choose the treatment that best fits your specific needs. 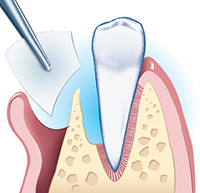 Bone grafting is commonly done during periodontal surgical procedures. If needed, we can add materials to regenerate bone that has melted away. The bone used for this procedure can be your own bone, bone from a tissue bank, bovine bone or synthetic materials. Bone grafting can add years of life to a compromised tooth or even totally reverse the damage. When gums have receded, or there is damage below a tooth root in the area where it branches out (furcation), we may use Emdogain gel. This revolutionary product utilizes a protein to stimulate regrowth of gum tissue, ligament and bone that have been lost due to moderate-to-severe periodontitis. Regaining the structural support provided by these hard and soft tissues helps save your tooth. Platelet-rich plasma (PRP) is a preparation derived from a patient’s own blood, and is used by surgeons to help improve surgical outcomes. Blood is primarily composed of liquid plasma, but it also contains tiny solid components; red blood cells, white blood cells and platelets. Platelets are blood cells that help stop bleeding by clotting blood, and they also contain proteins called growth factors. PRP is made from a small sample of your own blood. The blood is spun down in a sophisticated, computerized centrifuge to concentrate your platelets. These concentrated platelets containing huge reservoirs of growth and wound healing factors are added to remaining plasma, and can dramatically enhance and accelerate your body’s natural healing process after surgery. Gem 21 is a state-of-the-art approach to rebuilding bone and tissue that combines an active growth factor (PDGF) with a synthetic bone substitute. PDGF (plasma-derived growth factor) is a protein that plays a significant role in blood vessel formation and is used in periodontal surgery to treat bone loss. Guided tissue regeneration (GTR) is a process of placing a membrane to act as a barrier between tissues that heal more quickly (gums and ligaments) and bone. This procedure allows time for the bone to regenerate without the encroachment of the faster healing tissues. Dr. Weingarden was among a panel of ten American and international dental specialists who teamed up to compare studies regarding regeneration of bone. The panel established that the most effective solution to lost bone was Guided Tissue Regeneration. Smiles are known as “gummy” when the amount of gum tissue displayed when talking or smiling is disproportionate to amount of teeth shown. Our doctors use lasers to gently remove excess gum tissue and give a more balanced appearance to your mouth. Uneven gum lines can flaw the appearance of an otherwise lovely smile. Gum tissue can be easily modified with a laser to create a smooth, even gum line to frame your smile. Frenectomies involve the removal of a frenum in the mouth. A frenum is a muscular attachment between two tissues. There are two frena (the plural form of frenum) in the mouth that can sometimes obstruct normal function and need to be removed. The lingual frenum, which connects the tongue to the floor of the mouth, can run the full length of the tongue and interfere with speech. The maxillary labial frenum, which connects the inside of your upper lip to your gums just above your upper two front teeth, can become so prominent that it causes a gap between the two front teeth. For any type of periodontal treatment you may need, you can be assured that you are in kind, caring and experienced hands with our team of dental professionals.